Police in Brazil have arrested a motorist on suspicion of ploughing through a crowd of anti-austerity protesters in Sao Paulo. Caught on camera by a number of bystanders, the shocking incident happened on Friday as demonstrators were protesting Brazil’s austerity government on Dutra highway. According to G1 Globo, the group invaded the eight-lane highway near the city Sao Jose dos Campos at around 1pm to voice opposition to the economic reforms being proposed by the government of President Michel Temer. 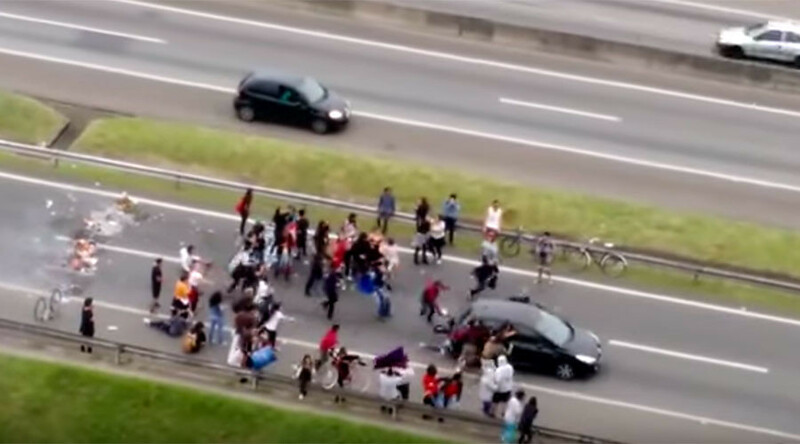 Footage shows at least 30 people, some carrying ‘General Strike’ placards, blocking traffic on an exit ramp before a dark colored Peugeot 307 tries to makes its way past. Unable to navigate around the wall of protesters, the driver of the vehicle suddenly accelerates and bowls over a number people obstructing the road. As the car speeds off, at least three people can be seen lying injured on the tarmac. Two women were taken to hospital with injuries. The driver was later apprehended nearby by highway patrol officers. When questioned by police, the 44-year-old man said his grandmother had been hospitalized and he was in a rush, report UOL news. Normal service at the Dutra highway eventually resumed after 2pm. The Brazilian government’s bid to pull the country out of recession, including plans to slash pensions and raise the retirement age, has provoked outrage among the population. Clashes between police and workers protesting austerity have been witnessed in Rio de Janeiro, while major transport routes in Sao Paulo and Brasilia had to be closed because of unrest.